Mikael Forssell has left Birmingham and signed a three-year deal with Bundesliga side Hannover 96. The 27-year-old Finnish international striker's current deal at St Andrew's was scheduled to expire in June. Hannover's sporting director Christian Hochstatter told the club's official website: "We are very happy that we could persuade Mikael to join." 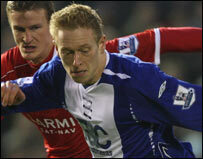 And Forssell added: "I am looking forward to playing for Hannover and in the Bundesliga." Birmingham boss Alex McLeish believes that his squad will have enough goalscoring potential to challenge for an immediate return to the Premier League, even without Forssell. He said: "We have good strikers here already. "Cameron Jerome can look back at his first season in the Premier League and say he did well, but there's definitely a chance for him to really shine and get back to the Premier League and show what a potent force he can become. "With Garry O'Connor, although I believe he still has to win over the fans, he can use his left foot, right foot, he's quick enough and he's good in the air but he's got to come back with all guns blazing." McLeish is also confident that James McFadden will stay at the club for next season despite their relegation. "McFadden of course was on fire before his injury and it was a shame to lose him at such a critical time at the end of the season," said the Blues manager. "But as far I'm concerned he's definitely staying. "It would need to be a ridiculous offer and an offer that would enable me to bring in somebody as good or better."